Meet Laura D. DeGiacomo, The Hanover Theatre’s perfect 10! It’s been an incredibly productive first week of rehearsals for our 10th anniversary production of “A Christmas Carol.” There are many familiar favorites back in the cast such as Jeremy Lawrence (Scrooge) and Kathy St. George (Mrs. Fezziwig), as well as talented newcomers you won’t want to miss. But today it’s time to shine a spotlight on our “perfect 10,” Laura D. DeGiacomo. Laura is the sole cast member who has appeared in every performance of “A Christmas Carol” at The Hanover Theatre over the last ten years. And we are thrilled to have her back! When I first joined the cast, Laura played Belle, Young Ebenezer’s love interest. Over the past few years, she’s become another important love interest, Millie, Fred’s wife. Undoubtedly, I always look forward to watching Fred and Millie waltzing across the stage in their beautiful party attire, accompanied by Tim Evans on the Mighty Wurlitzer Organ. Laura also shines in her haunting rendition of “Coventry Carol” at Tiny Tim’s funeral sequence. We often have to tell the children in the cast to keep their “brave faces” on while listening to her number because it is easy to be moved to tears upon hearing her sing it. Earlier this week, we were able to sneak out of our busy rehearsal day to take a quick stroll down memory lane. Check out the exclusive interview below and don’t miss our “perfect 10” performing December 15 – 23! 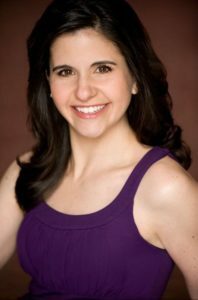 Laura D. DeGiacomo is a musical theatre graduate from Emerson College with a secondary concentration in dance. National tours include, “Grease” (Sandy/ Patty), “Showboat” (Kim), and K.Hill’s “Phantom of the Opera” (Jammes). Her regional favorites include “Mary Poppins” (Mrs. Banks), “Anything Goes” (Hope), “Fiddler on the Roof” (Chava), “Sisters of Swing” (Patty Andrews) and “Babes in Toyland” (Mistress). In addition to performing, Laura also choreographs for a number of theatre programs including Wheelock Family Theatre, Stonehill College, The Freelance Players, Littleton High School and The Village Theatre Project. This entry was posted in A Christmas Carol, Family-Friendly Shows, Features, Holidays in Worcester, Upcoming Shows. Bookmark the permalink. 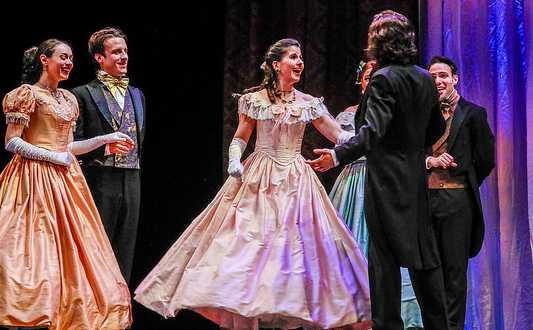 3 Responses to Meet Laura D. DeGiacomo, The Hanover Theatre’s perfect 10! Congratulations Laura, I remember the first time you played Belle at ASF… so many years ago. I am very proud to know you since birth. I don’t get to see you but your proud mother tells me all about you. I also am proud of you. Keep being a local actress. Some day you will be on Broadway.